The farmhouse is a four bedroom property with panoramic countryside views. The property consists of a lounge/dining room, kitchen and bathroom on the ground floor, with one double bedroom, two twin bedrooms, one single bedroom and a further bathroom on the first floor. Idyllically situated with magnificent views, The Barnhouse sleeps eight and has the added bonus of three bath/shower rooms. The ground floor consists of a living/dining room and kitchen. On the first floor there are four bedrooms - one double with en-suite shower room, and three twin rooms (one with en-suite bathroom). There is also a family bathroom on the first floor. Hawes Caravan and Motorhome Club Site is set in beautiful Wensleydale, where the famous cheese has been made for nearly a century. Situated between the River Ure and the market town of Hawes, the caravan park offers attractive views. With the beautiful Dales and the Pennine Way right on the doorstep, walking enthusiasts will have hours of captivating landscape to explore. Also within easy reach from the caravan park, Hawes market town is blessed with an immense character that really needs to be experienced. 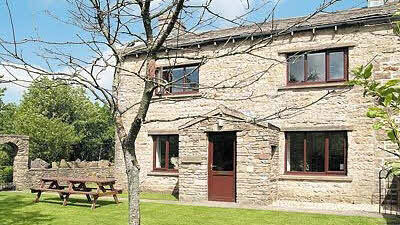 Both properties at Hawes are available to book through Welcome Cottages.